The mongoose lemur is a medium-sized lemur, about the size of a small house cat. Its head and body length is about 35 cm (14"), and it weighs about 2 kg (4.4 lb). It maintains a horizontal body posture and moves quadrupedally. In Madagascar the mongoose lemur is found in dry deciduous forest and secondary forest. In Comoros it is found in humid forest. It is arboreal. During both the wet and the dry seasons, fruit appears to dominate the mongoose lemur diet. In the wet season, it is also known to feed on fresh flowers, particularly those from the kapok tree. In addition, the mongoose lemur is extremely fond of nectar. More so than other lemurs, the mongoose lemur is active at different times of the day, depending on the season. During the wet months (December to April) there is considerably more diurnal and/or crepuscular (evening) activity. With the onset of the dry season in May, there is a shift towards nocturnal behavior. 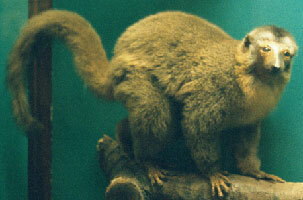 Mongoose lemurs live in small family groups consisting of a monogamous adult pair and 1 - 4 of their immature offspring. Social bonds within these family units appear to be strong, with groups being very cohesive during feeding, traveling, resting and sleeping. Home ranges are small and there is often overlap with the range of another group. Neighboring groups encounter each other rarely, but when they do, the encounters are marked by aggressive vocalizations, much scent marking and physical charges and threats. The mongoose lemur has always been uncommon. Its natural range is restricted to northwest Madagascar. It has also been introduced to Comoros, where populations occur on the islands of Anjouan and Moheli. Major reasons for the decline of the mongoose lemur include the destruction of its forest habitat due to logging and agriculture, hunting for food, and persecution due to its alleged raids on crops. The dry deciduous forests of northwestern Madagascar continue to be cleared to create pastureland and produce charcoal. This loss of habitat is the primary threat to the survival of the mongoose lemur, but it is also hunted for food throughout much of its range. In addition, it is occasionally trapped for the pet trade. In Comoros, the mongoose lemur faces similar threats. *** It has been illegal to kill mongoose lemurs in Comoros since 1974, but few Comoriens are aware of this (Reason & Trewhella 1994) . Adult size and coloration is attained between 14 - 16 months (Garbutt 1999) . Sexual maturity is attained at 2.5 - 3.5 years (Duke Univ. Prim. Ctr. 2004) . The young are born around October - November (Garbutt 1999) . Single infants are typical, but twinning occurs rarely (Duke Univ. Prim. Ctr. 2004) . Females seem capable of giving birth each year (Garbutt 1999) . Minimum viable population density: 350 individuals/sq km (910 individuals/sq mi) (Silva & Downing 1994) .